TALLAHASSEE, Fla. — Florida State earned its sixth consecutive ACC regular season championship this season and were well represented on the 2018 All-ACC Teams, as announced by the league on Tuesday. 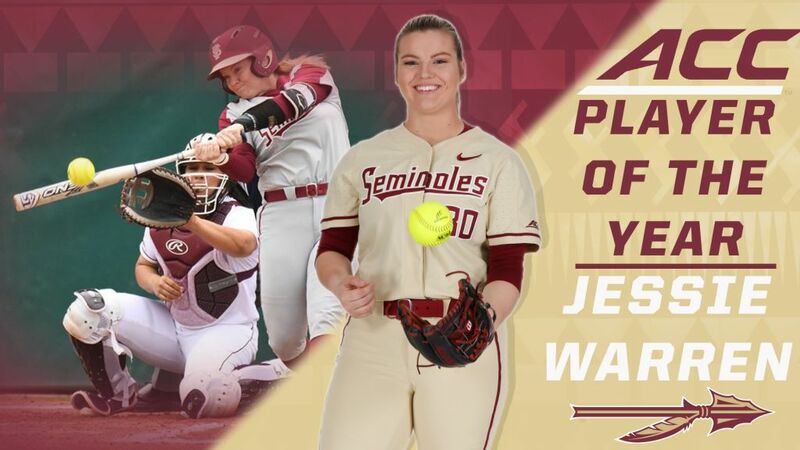 The Seminoles placed six student-athletes on the 2018 All-ACC Teams, with five on the All-ACC First Team, including ACC Player of the Year Jessie Warren, ACC Pitcher of the Year Kylee Hanson and ACC Freshman of the Year Sydney Sherrill. 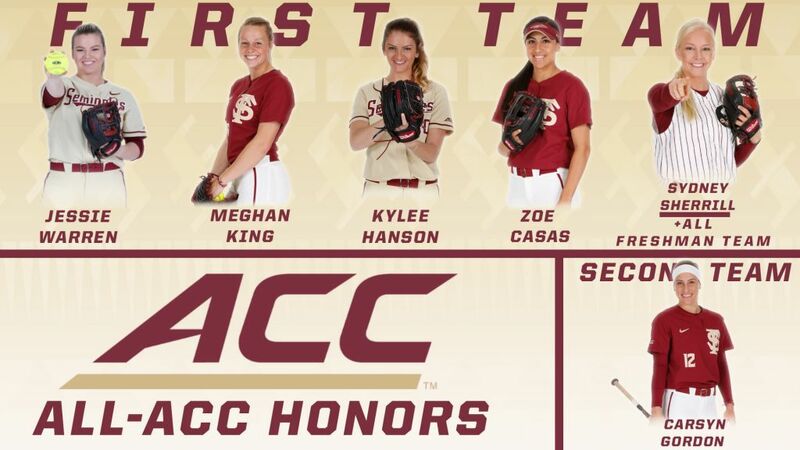 Zoe Casas and Meghan King were also All-ACC First Team members, while Carsyn Gordon was selected to the All-ACC Second Team. Sherrill was also named to the All-ACC Freshman Team. FSU led all schools with six All-ACC members, followed by Boston College and North Carolina with four apiece. Warren becomes just the second player in ACC history to earn a spot on the All-ACC First Team in all four seasons since the league started naming a first and second team in 2005, joining Georgia Tech’s Kelsi Weseman (2009-12). Prior to 2005, there were six players that were named to the All-ACC Team in each of their four years – Laura Williams (GT – 1994-97), Brandy Arthur (UNC 1995-98), Natalie Anter (UNC – 1999-02), Kristen Dennis (UNC – 1999-02), Brandi Stuart (FSU – 2000-03) and Jessica van der Linden (FSU – 2001-04). “Really proud of this crew and also the entire team and program this season,” said FSU head coach Lonni Alameda. “It has been a challenging year with a young team and we weren’t sure how all the pieces were going to fit together when we started it all in the fall. But everyone has worked hard and gone through the ups and downs and come together as a team to find a lot of success. It is the third year in a row and ninth time overall that FSU has earned ACC Player of the Year, while the Noles have had the conference’s best pitcher for five straight seasons and six times in program history. It marks the eighth time overall, and first since Warren in 2015, that Florida State has received ACC Freshman of the Year honors. Warren earned her second consecutive ACC Player of the Year Award and completed the conference season by leading the league in home runs (7), slugging percentage (.920) and on base percentage (.597). 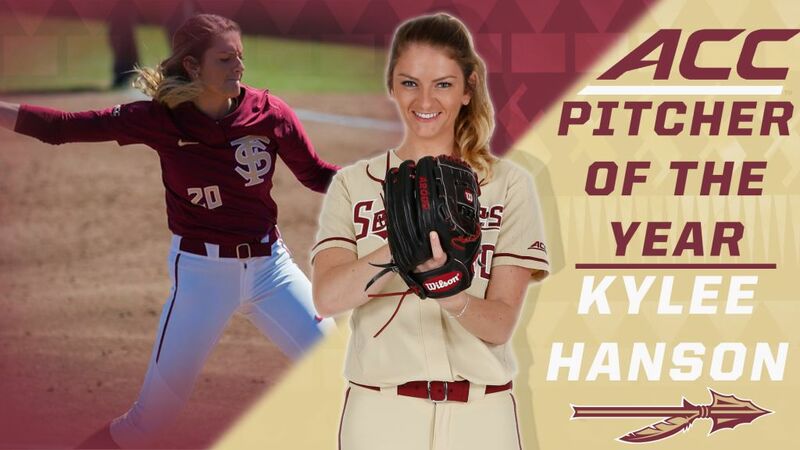 Hanson posted a 13-1 record in ACC play this season with a 0.98 ERA and 95 strikeouts in 78.1 innings. Opponents batted just .128 against her during league play. Sherrill hit 11 of her NCAA-leading 24 doubles in ACC play and batted .307 overall with 16 RBI and 13 runs scored. She added nine stolen bases and committed just three errors all season defensively. Casas finished second on the team with a .343 batting average in ACC play with five doubles, three home runs and 16 RBI. King led the ACC with a 0.82 ERA in league play and finished with a 7-2 record over 60.0 innings. She gave up just seven earned runs and 16 walks as teams managed a .175 batting average against her. Gordon was perfect in 149 defensive chances at first base during the ACC season and led the conference with 21 runs scored and 23 walks. She added a .323 batting average with four doubles, three home runs, 19 RBI and eight stolen bases in league play this year. Follow Florida State softball on Twitter (@FSU_Softball) and Instagram (fsusoftball), and like our Facebook page (Facebook.com/FSUsoftball) to keep up to date with everything about Seminole softball.